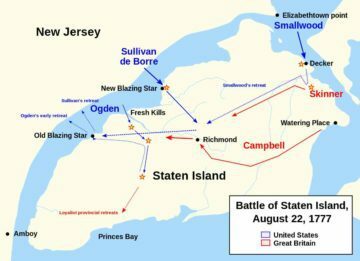 The Battle of Staten Island was a raid by Continental Army troops under Major General John Sullivan against British forces on Staten Island. After British Lieutenant General William Howe sailed with most of his army from New York in July, the Americans recognized that the British position on Staten Island was vulnerable, and planned an attack. Sullivan's Raid was well-executed, but it suffered from a shortage of boats to effect the crossing, and one of its detachments was misled by its guide to the front of the enemy position rather than its rear. As a result, Sullivan did not take as many prisoners as expected, and had about 200 of his own men taken prisoner due in part to the lack of boats. Although Sullivan was accused of mismanaging the raid, a court martial held later in 1777 exonerated him of all charges. Armies - American Forces was commanded by Gen. John Sulliavan and consisted of about 1,000 Soldiers. British Forces was commanded by Gen. John Campbell and consisted of about 1,300 Soldiers. Casualties - American casualties were estimated to be 10 killed, 15 wounded, and 150-260 captured. British casualties were about 5 killed, 7 wounded, and 84 missing. Sullivan had learned that the departure of Howe's British army had left Staten Island vulnerable, and planned and put into execution a raid against British targets there. Sullivan had learned that although the bulk of British regulars were near the northern end of the island, about 700 New Jersey Loyalist militia were scattered along the western shore, facing the New Jersey mainland. Sullivan's plan was to cross two groups onto the island from points in Elizabethtown (present-day Elizabeth, New Jersey), capture prisoners from the isolated militia outposts, and destroy supplies. They would then go to the Old Blazing Star Ferry (between present-day Carteret, New Jersey and Rossville, Staten Island) to return to the mainland. British defenses on the island, under the overall command of Brigadier General John Campbell, consisted of the regular army elements from the 52nd Foot, regiments of Hessians, and the Loyalist New Jersey militia known as Skinner's Brigade, under the command of Cortlandt Skinner. Campbell's men numbered about 900, and were stationed near the northeastern tip of the island. Skinner's men, numbering about 400 according to Campbell's report, were stationed at outposts along the western shore between Dexter's Ferry and Ward's Point. On August 20, Sullivan, at his base in Hanover, New Jersey, ordered his commanders to prepare their troops for a march the next day.Sources do not describe the precise composition of the troops chosen, but most of them were drawn from Sullivan's division, which consisted of the First and Second Maryland Brigades. These brigades comprised the regiments of the Maryland Line; additional troops chosen for the operation included companies from the 2nd Canadian Regiment and a company of New Jersey militia. On the afternoon of August 21, two columns numbering about 1,000 in all left the camp. One column was led by Brigadier General William Smallwood, and the other, headed by Sullivan, consisted of troops led by a French officer who had been given a Continental Army brigadier's commission, the Chevalier Philippe Hubert Preudhomme de Borre. After reaching Elizabethtown late that evening, they rested for a few hours, and began crossing early the next morning. One detachment, led by Colonel Matthias Ogden, crossed opposite Fresh Kills and rowed partway up the kill, in order to approach their target, the militia brigade of Elisha Lawrence, from its rear. The remaining troops crossed near Palmer's Run on the north side of the island, where they split into three groups. Smallwood and Sullivan led most of their columns away to attack specific targets, each leaving a regiment behind to cover their line of retreat. Ogden attacked Colonel Lawrence's outpost at dawn, surprising and routing the militia company. After a few minutes of battle, he had taken 80 prisoners, and he moved on to the outpost of Lieutenant Colonel Edward Vaughan Dongan, commanding the 3rd Battalion of Skinner's Brigade. Dongan's men put up stiff resistance, even though he was mortally wounded. This prompted Ogden to retreat toward the Old Blazing Star. After waiting there as long as he thought prudent, Ogden crossed his men back to the mainland before Sullivan and Smallwood arrived. 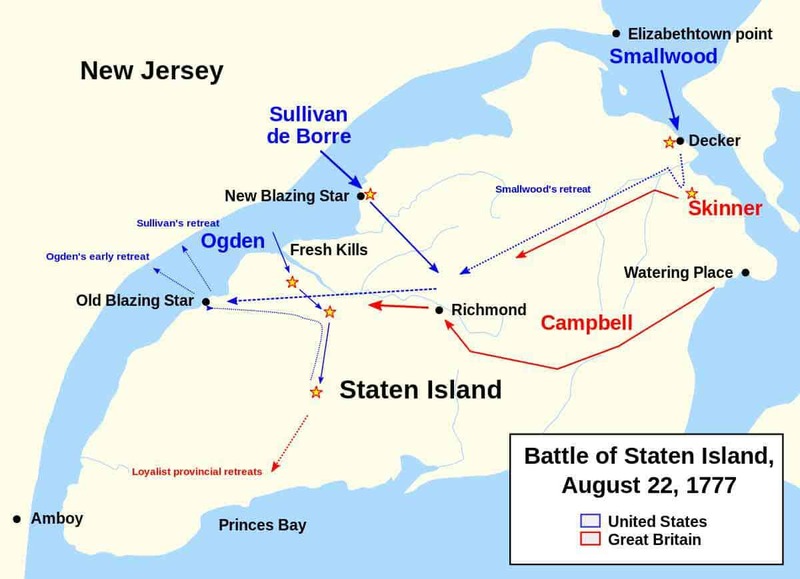 Sullivan moved to attack Skinner's 5th Battalion, under the command of Lieutenant Colonel Joseph Barton, at the New Blazing Star Ferry, but these troops were alert, and fled when Sullivan's forces advanced on them. Although Sullivan had placed troops to intercept men who tried to get away, many of Barton's men escaped, crossing over to the Jersey shore or hiding in the woods and swamps of the area. Sullivan took 40 prisoners, including Barton. Some of his men advanced on Skinner's headquarters, but the force there was too strong, and the Americans retreated. Smallwood's column was led by its guide to the front of the Loyalist Battalion of Abraham van Buskirk, instead of its rear. He ordered the attack anyway, and Buskirk's men fled until they were rallied by Skinner, and the tables were then turned on the Americans. They beat a hasty retreat, although they had time to destroy camp supplies and equipment, and managed to seize a battle standard. Smallwood and Sullivan joined forces near Richmond, a village in the center of the island, and made their way to the Old Blazing Star. Sullivan sent for the boats to speed the crossing, but they never arrived, so he began crossing the troops and prisoners using the three boats that Ogden had commandeered to cross earlier. As they did this, Skinner and his company approached, accompanied by the forces of Campbell, the 52nd, and the Waldeck and Anspach regiments. Sullivan ordered the companies of Major Stewart and Major Tillard to cover the retreat. Numbering roughly 80 men, they successfully held off the accumulated British forces until all other American troops had crossed to the mainland, repulsing several determined attempts to break through their line. Although some of this covering line managed to escape, a number of men were killed, and a sizable number surrendered after they ran out of ammunition and the British began firing grape shot at them. Sullivan's forces marched south after the battle, and were able to join General George Washington's defensive arrangements south of Philadelphia in time to participate in the key Battle of Brandywine on September 11.